As per Huawei the Kirin 980 is the world's first commercial mobile phone SoC chipset made with TSMC's 7 nm process, integrating 6.9 billion transistors to improve both performance and energy efficiency. 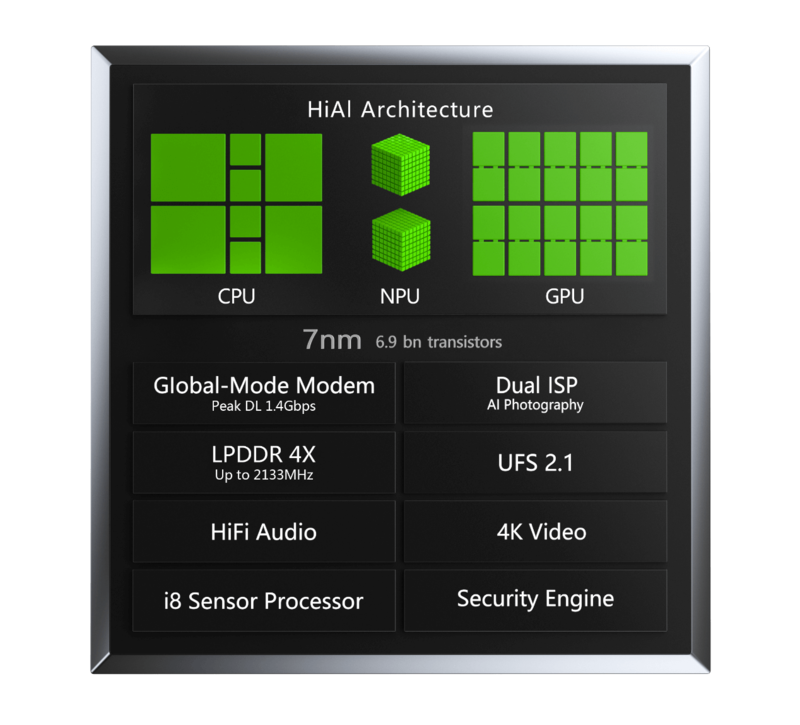 It is the first of its kind developed based on ARM Cortex-A76, with a dominant frequency of up to 2.6 GHz. The design of the Kirin CPU subsystem and intelligent flex-scheduling mechanism are ideal for achieving optimal energy efficiency while providing excellent performance. The Kirin 980 is also the world's first commercial SoC chipset that uses the innovative Mali-G76 GPU. With its optimization technology and guaranteed battery life, the Mali-G76 GPU allows users to play massively multiplayer online games (MMOGs) smoothly. The Kirin 980 supports the world's fastest LPDDR4X with the rate up to 2133MHz, 14% faster than the industry average and is the first to integrate dual NPUs. This provides the most powerful AI computing capability available in the industry and offers increased support for AI applications, bringing mobile phones into the smart era. The Kirin 980 is the first to support LTE Cat.21 in the world, which achieves stable and fast mobile communication connections in various complex communication scenarios, with an industry best peak download rate of 1.4 Gbit/s. The Kirin 980 uses Huawei-developed ISP 4.0, improving the pixel throughput by 46%, supporting more cameras, and greatly enhancing the noise reduction and color reproduction capabilities. These features allow mobile users to enjoy clear pictures and good video experiences. A more powerful and open HiAI ecosystem provides improved AI development capabilities and a convenient development environment for developers. What the key features of Kirin 980?